When the stars align, they surely align, and that is exactly what is happening as country music’s chart-topping group Rascal Flatts, award-winning CCM icons Point of Grace and Phil Keaggy, and comedians Henry Cho, Nate Bargatze and John Crist have all signed on to perform and honor Michael W. Smith during the once-in-a-lifetime tribute event taking place April 30th. 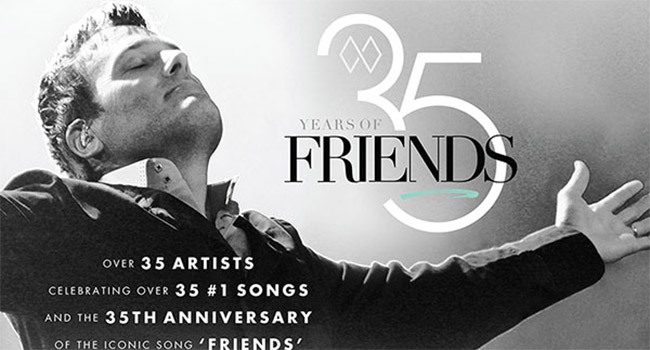 Thirty-Five Years of Friends: Celebrating The Music Of Michael W. Smith will take place at Bridgestone Arena in Nashville, Tennessee, and will also include performances by Amy Grant, Bob Goff, Brian Littrell from the the Backstreet Boys, CeCe Winans, Chonda Pierce, Danny Gokey, Donnie McClurkin, Francesca Battistelli, The Gatlin Brothers, The Isaacs, Jars of Clay, Jason Crabb, Jim Brickman, Jordan Smith, Jordin Sparks, Justin Flom, Laura Story, Lee Greenwood, Mac Powell, Matt Maher, Matthew West, MercyMe, Natalie Grant, Newsboys, The Oak Ridge Boys, Phillips, Craig and Dean, Randy Travis, Ricky Skaggs, Russ Taff, Sandi Patty, Scott Hamilton, Vince Gill, Wayne Kirkpatrick and the Original MWS Band, and Wynonna. Promoted by Outback Concerts and produced by Tony Conway of Conway Entertainment Group, music lovers will experience over 40 artists from all genres, performing a set list to include many of Smith’s 35 No. 1 hit singles. With over 45 Dove awards, three Grammy awards, and an American Music award, Michael W. Smith has forever enshrined his mark in the music history books. Smith garnered yet another Grammy nomination in 2018 for “Best Contemporary Christian Music Album” for his latest worship effort, Surrounded. Tickets are available at all Ticketmaster locations and the Bridgestone Arena Box Office.